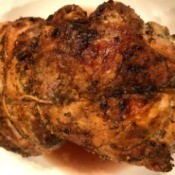 The everyday experts in the ThriftyFun community share their favorite recipes for lamb. Lamb Roast with Garlic and RosemaryThis is a main courses that is easy to prep, marinate and toss it in the oven. Very suitable to make especially when hosting a small get-together. This boneless lamb roast is delicious and pairs well with side of roasted vegetables and garlic bread. 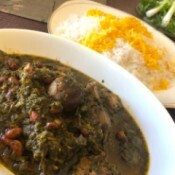 Lamb and Herb Stew (Ghormeh Sabzi)This has been one of my favourite Persian stews since I was a little kid. There is truly nothing like it. This is another one of those recipes people ask for my instructions on often and it's best I put it up here with pictures for everyone get use out of. This is my late grandmother's recipe, taught to me by my mother. You can use beef in place of lamb, or just make it vegetarian. Greek Style Lamb and PotatoesI never liked lamb much until I learned how to choose the right cuts and prepare it myself. You always want to choose cuts that are pink and rosy in colour; never dark red. 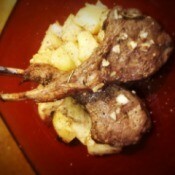 This is a complex-tasting, easy to prepare Greek version of lamb chops that my family adores. Skipping the restaurant versions is fine by me, and my wallet!